The Road To Fame Starts Here! Aside from practicing dance skills and formation, flexibility and coordination are two qualities that every dancer needs to possess. These skills increase a dancer’s ability to perform basic and advanced dance routines, as well as learn alternative dance styles. Many people believe that flexibility and coordination can only be achieved at a young age. While it’s beneficial for kids to perfect flexibility while they’re young, older children and adults can still improve their coordination through simple exercises. At Miss Colleen’s Elite Dancentre, we focus on every aspect of a dancer’s ability, including their flexibility and coordination skills. We believe that with a little bit of patience and effort outside of the dance studio by performing these easy exercises. 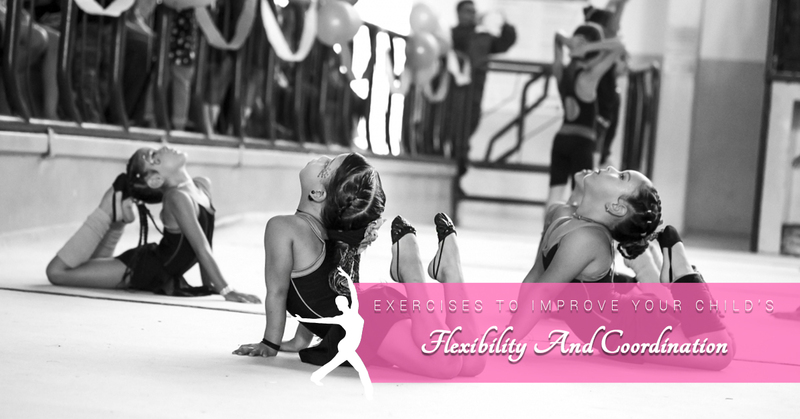 Read on to learn which simple exercises you can practice with your child to improve flexibility and coordination. Interested in registering your son or daughter in dance lessons? Visit Miss Colleen’s Elite Dancentre! We are Rockville’s leading dance studio for kids and we are proud to offer ballet, hip-hop, jazz, tap, pointe, and more! Contact us today. While stretching may not be very exciting, there are several reasons we stretch our muscles before and after a workout and dance classes. For a well-rounded routine, it’s important to incorporate a good 10-15 minutes of stretching to reduce muscle tightness and make dance classes more efficient. Stand tall with your feet hip-width apart. Slightly bend at the knees with arms by your side. Bend forward as you exhale, lower your head to the floor, and keep your head, neck, and shoulders relaxed. Wrap your arms around the backs of your legs and hold for 45 seconds to two minutes. This stretch focuses on the hip rotator, the flexor muscles, and the IT band. This pose is extremely gentle. Begin with laying on your back with your feet flat on the floor. Cross your left foot over your right quad. Lift your right leg off the floor and grab onto the back of your right leg then pull gently toward your chest. You should begin to feel the muscle stretch, hold there for 30 seconds to two minutes. Switch sides and repeat. The butterfly stretch is a common stretch and highly effective. Sit tall on the floor with the soles of your feet together. Knees bent outward at the sides. Hold onto your ankles or feet, engage your abdominals, and slowly lower your torso toward your feet as far as you can while pressing your knees toward the floor. If the muscles are too tight to bend over, then remain sitting tall and just press your knees toward the floor and hold for 30 seconds to two minutes. Stretching your hip flexors is the best way to improve both flexibility and coordination, especially for dancers. Begin with kneeling down on your left knee and place your right foot flat on the floor in front of you and bend at the knee. Lean forward, stretching your left hip toward the floor. Squeeze those glutes! This will allow you to stretch your hip flexors even more. Hold for 30 seconds to two minutes, switch sides and repeat. Lie on your back with both legs extended forward, flat on the floor. Pull your right knee into your chest, while keeping the left leg straight and your lower back pressed into the floor. Hold this pose for 30 seconds to two minutes and switch to the other leg and repeat. The yoga ball strengthens core muscles and encourages perfect posture while improving balance and coordination. Lunges are a great way to strengthen muscles and increases flexibility. This sounds a little silly, but balancing on one leg for an extended amount of time strengthens the core and exercises your muscle control. Poor flexibility doesn’t only impact your child’s athletic skills, but it increases the risk of injuries when performing the slightest physical activity. Children are expected to be active and mobile throughout the day, and improving their flexibility and coordination will drastically improve their dance skills too. Miss Colleen’s Elite Dancentre focuses on teaching dance lessons in Rockville to young students of all ages while also enforcing stretching and warming up the muscles to improve coordination and prevent injuries. Our safe and nurturing dance academy in Rockville is the best place for you children to experience many different dance forms. We are honored to witness students grow from toddler dance classes to advanced dance classes featuring ballet training, tap dancing classes, hip hop classes and eventually open the doors to our competitive dance program. If you are interested in registering your child in the best dance studio in Rockville, then look no further than Miss Colleen’s Elite Dancentre! Visit our site now and register for classes today. ©2017 Miss Colleen's Elite Dancentre - Do not copy. All rights reserved.